I don’t know why we buy bananas, without fail, during every trip to the grocery store especially since we rarely give them a second look once they get to the fruit bowl. I usually end up throwing them out, a couple of days later, when they are overly ripe. Every once in a while I make a banana bread not because I’m too crazy about it, but because I can’t think of anything better to do with a bunch of bananas (other than making the occasional smoothie, pancake or batch of muffins) that are rapidly spoiling. I've made a couple of different versions of banana bread since I first started baking but never one that’s been spiced up like this. 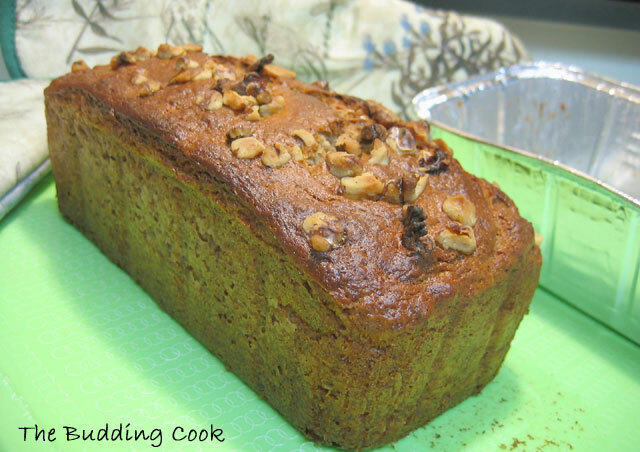 This is a very nice spiced bread/cake to bake especially this time of the year, it being the holiday season and all. Cream the butter and sugar together. Add the egg; beat well. Add the mashed bananas, sugar and vanilla extract. Mix well. Mix the dry ingredients together and combine with the wet ingredients. Add a few walnuts to the batter and sprinkle the rest on top. Pour into the greased loaf pan. Bake for 45-50 minutes at 375 degrees F, then turn off the oven and let it continue to remain inside for another 5-10 minutes. I’ve baked a couple of different versions of this bread over time and this seems to be one version that I will keep going back to. I lurve banana bread. Any time. All the time. love the choice of spices used.. 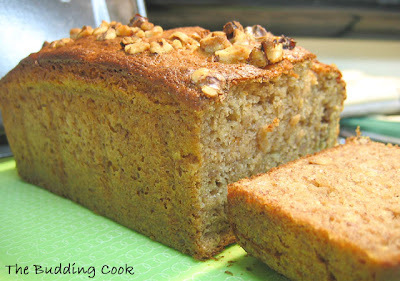 I am a fan of banana bread :)..
Have blogged the same recently..addition of ginger and other spices is new to me.. :)..I have not tried with any additions thinking they would suppress the natural banana flavour. I am the same, none of us like bananato eat them alone, unless if i make a fruit dalade, i still buy them and it end up in cakes. Freeze them when they are ripe and then you can use them when you want to make a banana muffin. Hey,thats a cool one,wish i could eat a slice and really give a nice *burp*,excuse me! wow .. what a beautiful loaf. it happens with me too. i always buy bananas and end up throwing some :) so i buy only 2-3 banans everytime i go to grocery stores. more than that becomes a waste. Wow, this looks yummy! I'm giving it a try! Spiced loaf, perfect for the season! perfect banana bread. looks yum! I must say the texture of your banana bread looks very nice. I love banana breads! Your spiced version sounds great! Just like you I end up buying bananas every time I go to the grocery store. When I see the signs of overriping, I toss them in a freezer and use when I need. i've just frozen a bunch of overripe bananas. u r so right - its banana loaf time! Hi TBC, for some reasons I missed your posts and I thought you were in Inida ( I know, I know I must be living in a cave). I have the same problem of using up bananas. I loved your version of the bread. Thats lovely, fluffy and delciious! hmmm I can smell them... looks heavenly with all those spices. perfect for a warm holiday evening! I think buying bananas and then leaving them until over-ripe, is a universal thing! I have to pick up bananas when I go grocery shopping too, and then the poor things just sit there until someone takes mercy and has one or makes banana bread. Love this recipe ... especially the use of spices. I am sure your kitchen smells heavenly after baking! Wow... I am not sure if this is my first time here... but this bread looks amazing. Yeah bananas are a staple at my home too, but I end up not using them most of the time. I guess they are too versatile at times to use my imagination. Amazing bread, TBC! I love the flavors you used - cinnamon rocks any bread for me! Good idea! Have you tried making banofee pie? hat's another good use of soon to go off bananas. I have the same problem too.. buying them everytime.. One day I decided not to buy and hubby asked for the same!!! I have some to ripe banana's if they overripe.. will try this as it looks yummy... loved it texture.. I love banana bread. This looks really good. I like this idea of spicing up an ordinary banana bread. I have been making mine a little more interesting by including dried coconut, but this seems more seasonally appropriate. I'm going to try it out! lovely bread..tbc..Merry Christmasn & A Happy New Year ! We have banana trees in our yard and it seems that we either have no bananas or 200 at one time ...lol! Banana bread is the answer ... freeze them for gifts during the holidays along with a recipe card. Everyone loves homemade for the holidays! That is one lovely looking banana bread! Kevin & Miri- thank you!